Customizing the login screen appearance on a Mac is a nice way to add some personal (or corporate) flair to the OS X login experience. 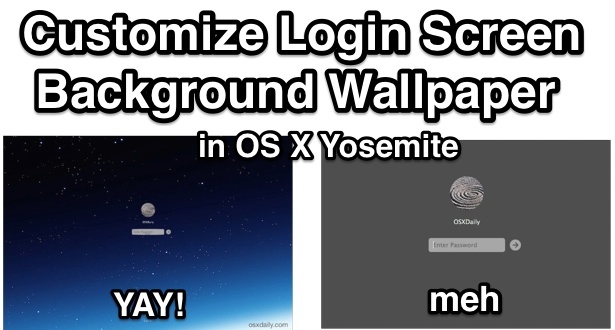 How exactly to change the login screen wallpaper has differed continuously in the many versions of Mac OS throughout the years, but with OS X Yosemite, the process of setting a custom wallpaper is perhaps the easiest it has been in quite some time. 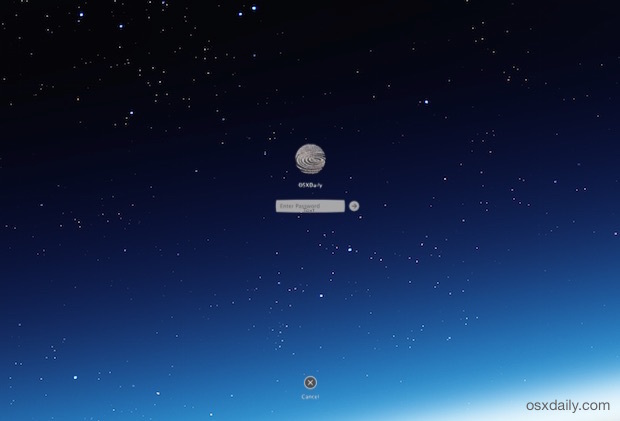 Setting a unique login wallpaper this way is easily done and easily undone too. You can change the background image to anything you’d like, so if you have a picture handy that you’d like to use that’s great, otherwise you can look in our wallpapers section for something that suits you. Back up your Mac with Time Machine before beginning, though this is a minor change you will want to have a fresh backup anyway just in case you somehow mess something up. For the purpose of this walkthrough, we’re going to use one of the hidden wallpapers in OS X of a Cosmos moon / earth shot. That secret wallpaper selection in OS X offers many great options to use on any Mac, and the files are already in the proper format. Whatever image you wish to set as the login background must be a PNG file, and it should be at least the size of your screen resolution if not larger. Your newly customized background login screen image will be set and you’ll see it upon the new login screen again, you will see this image when you log a user out, boot into the new login screen, or lock the screen to a login authentication window. You should not need to reboot the Mac to see the difference. For an added customization bonus, don’t forget you can add a message to the login screen of OS X too, this is a good place to put an ownership note or message, maybe even a phone number or email address to signify who owns the specific Mac. You’ll probably want to keep a copy of “com.apple.desktop.admin.png” handy unless you’re really thrilled with your newly customized login screen, that’s your choice. To reverse the customization, you’d simply want to move the backed up copy back into the original location in /Library/Caches/, as you can see in the screen shot above the backup for this particular walkthrough is just kept in the same folder. Log out to see the change as usual. For Mac users running a prior version of OS X, setting a custom login screen in OS X Mavericks is quite easy too. This great tip was discovered on LifeHacker, cheers to the find. Got it. Had to logout multiple times. Never changed anything. Works great, except all the images I choose become slightly greyed out, not fully vibrant like the OSXDaily’s once on the login screen. I wish I knew why. Awesome ….i tried and its works …thanks . Same as Toby here…..Yosemite has a blur to the image in the background by default. I think there is a way to turn this off, but haven’t gotten that far yet. I also got info on the file and locked it and haven’t gotten an error yet. Not sure if it will keep it from changing or throw an error or not. “The domain/default pair of (SystemUIServer, /Library/Caches/com.apple.desktop.admin.png) does not exist”. What I was doing wrong? Several utility apps such as MacPilot and Onys (free!) have always been able to facilitate changing these login pictures, and they still do. Thanks. Didn’t know OnyX. Great software. I found it on macrumors. Not working. 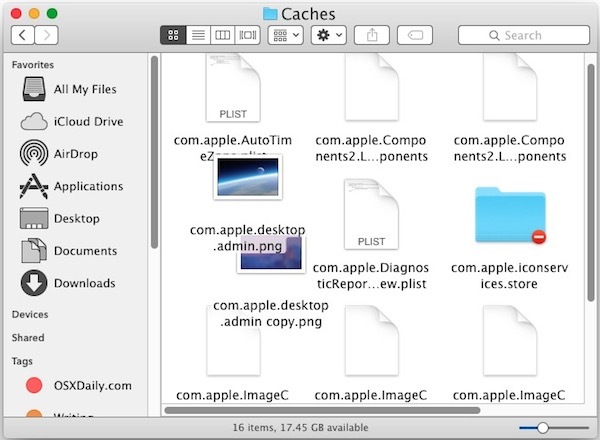 In /Library/Caches are just 2 folders: com.apple.iconservice.store and com.apple.spotlight. I can’t open either one of them. What am I doing wrong? 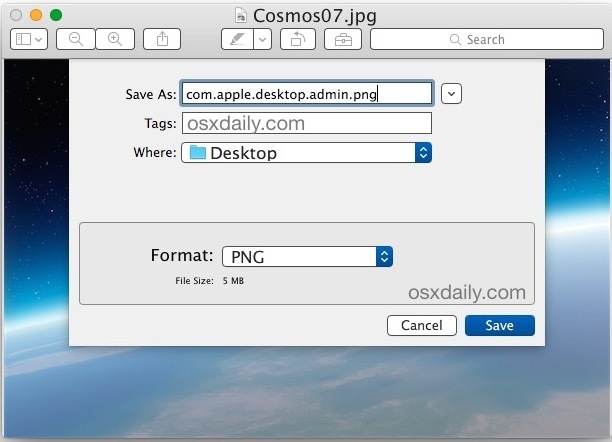 Just copy the file com.apple.desktop.admin.png to that folder. Solved. Log out -> log in = there it was. I can’t try this because I don’t have Yosemite installed, not sure If I should, hmm. Does this tip work on Mavericks and or Mountain Lion ? 1. Works for initial login screen, but old blurred login screen wallpaper still comes up after computer goes to sleep. 2. Would like to know how to remove gray haze effect from new custom login screen wallpaper. The sleep one is your current desktop picture. Not sure about the blur/gray effects though. Nice change to the main log in screen. Is there a way to change my lock screen to something other than Apple’s choice? It works…only for a few restarts, 1 or 2 nothing more. Then it goes back to the wallpaper you’re using at that moment. I know it’s not the main topic here but I have been looking around in the internet on how to change the Dashboard Background in Yosemite and I can’t find anything. I don’t have the pirelli files when looking for them in the Ressources folder. Does someone has an idea on how it is done? Can’t unblur the login screen image. Very bloody annoying.